Welcome to a world of mad, inspirational wonders and wild scientific theory wrapped in fog, run by gears, and lit by gaslight. 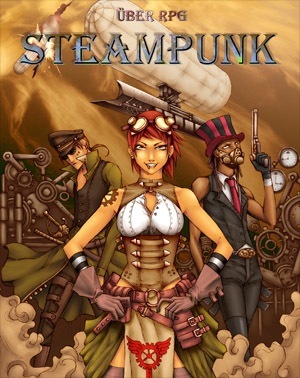 Steampunk is a venue for adventure, no doubt about that, with science and technology unhindered by the laws of physics, with societal norms from any culture past, present or future, and with only as much historical accuracy as fits the whims of the moment. It is a realm where anything is possible under the guise of skimming whatever we want from an idealized—or grossly imperfect—version of the 19th Century. Is this a RPG? Adventure? Sourcebook? art book? The description really does not tell me anyhitng about this. It's an RPG (the cover image indicated Über RPG). Normally we also include the rules system (if applicable) in parentheses for the product title. Apparently it is a self-contained d6 based system. You can purchase the PDF from their site for $15.00, along with one of their expansions. There are two other expansions that only appear to be detailed on DriveThruRPG. They appear to be available here on Paizo, but have no cover art or descriptions.